On top of Sugamuxi's mountains, an authentic marvel from nature. Páramos are a truly unique ecosystem in the world. Páramos are a specific ecosystem that only exist in the tropical belts of planet Earth and in just in 6 countries with high altitude mountains. The majority of the Earth's páramos are located in Colombia. Sugamuxi visitors have the rare opportunity to experience the páramo as this region has the highest concentration of páramos in Colombia. Nature adventurers, Sugamuxi is the place for you! - Visit páramos in Sugamuxi. The word "páramo" is a local andean term for a particular type of nature. It does not have a straight-forward English translation. Some may refer to them as highland-wetlands, peatlands, or moorlands. 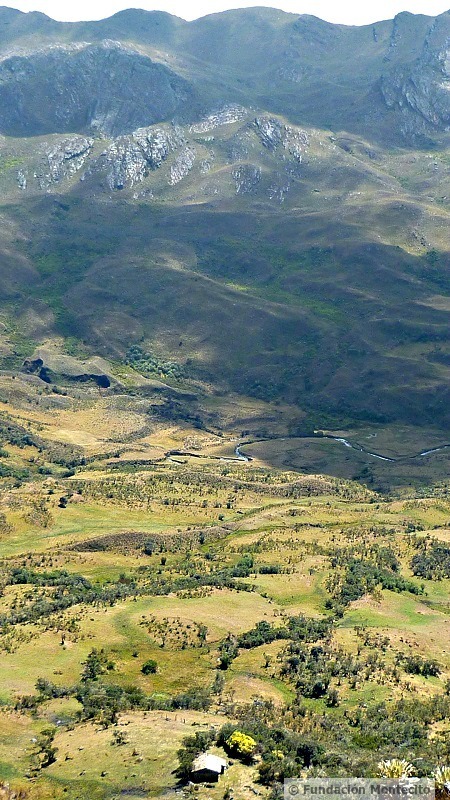 The word "páramo" is mainly associated with the highlands, the cold, drizzle and water in abundance, unique wetlands and fauna, and is also directly associated to the people who live and are culturally linked to this region. - [páramo ecosystem - English]. daily temperatures that vary by more than 20 degrees (Celsius) between day and night. the natural habitat for the Condor big-bird, pictured in the VisitSugamuxi logo, on the Colombian shield, and an icon of the Andes... hard to see but always flying high above! Visiting the páramos in Sugamuxi is like being in a restaurant with numerous options on the menu. With so many options to choose from, (diversified sites, trails & treks, dificulty levels, duration), proper advice from an experienced guide is recommended to help you navigate the differences between the varieties of páramos. This will ensure that you are able to compare which site will suite you best. A partial menu or the páramos are: Siscunsí, Ocetá, Sarna, Ogontá, Alfombras, Curíes, Suse, Hirva, Tota, Bijagual, Mamapacha, Pisba. Experienced and local guides for the páramos are usually available in the township tourist offices (any local will tell you where the township offices are). 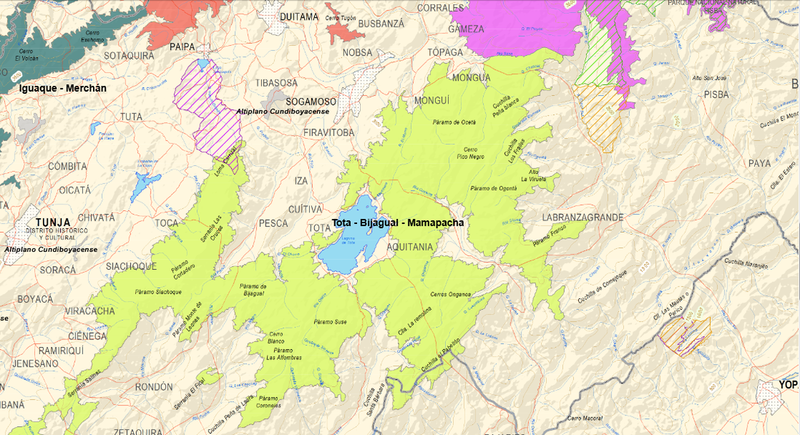 Towns of Sugamuxi with the most páramo areas are: Sogamoso, Aquitania, Cuítiva, Tota, Monguí, Mongua, Tópaga, Pesca, Tibasosa. Also, Hostels often have experience in local trekking routes and have the proper updated contacts for local and knowledgeable páramo guides. Highlighted in yellow and purple, on the map shown (original here), are the vast areas of páramos located in Sugamuxi. If you compare it with the official map of Sugamuxi, you can begin to understand why Sugamuxi is clearly a naturalistic gifted region. Visiting the páramos on your own, without an experienced guide, or not taking the minimum precautions, is not recommended. Some páramo areas are restricted and others are strictly forbidden. Even if you've made a plan or have a map to do the walk, do not do it on your own. The fact is, the trek can be risky and very dangerous. In these isolated areas, you may easily get lost and weather conditions in the páramos can become very extreme very quickly. If you are not well prepared, the experience could turn out very badly. Besides that, páramos are fragile ecosystems and visits should be taken with a high sensibility for water and nature conservation. Be prepared to walk! Levels of difficulty and duration vary from one páramo site to another which can be discussed ahead of time with your guide. But generally, long walks are frequent to experience a proper visit to these areas. 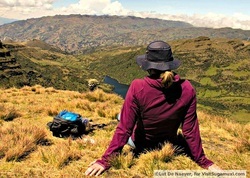 A visit to the páramos is a visit to highlands, above 3,000 m high, so oxygen levels are lower and the chances for tiredness or health imbalances (like altitude sickness) increase. The weather is commonly cold, windy, and rainy or misty. There are sunny days too and you may find yourself comfortable without a jumper, but this is the exception to the rule. The climate is unpredictable in the páramos and can change quite rapidly. Temperatures can typically have a variation of 20 degrees (Celsius). Chances for a sunny day depends on the season, but even in a dry season you may get wet. This video from Conservation International gives us a great glimpse of the importance of páramos, from a case in surrounding páramos of Bogotá. It also gives an idea of what you get in the páramos of Sugamuxi, the main land of muisca culture. [Versión en Español: ver aquí]. To get a páramos point of view from its accounting value, analyzed by the World Bank and their program WAVES, please check this video (03:22) from 2013 around Bogotá. And to know a bit more about WAVES planning to implementation for Lake Tota (located in our province of Sugamuxi), please explore this WorldBank link. Another important consideration when visiting the páramos is that they receive some of the highest impact of solar rays on Earth. Be sure to protect your skin against sun damage. Cloudy days are no exception to wearing sun screen. And last, bring your cameras! The páramos are so beautiful and unique that you won't want to miss out on capturing the memories. Also, please keep in mind that these lands are sacred. We politely ask for your respect and consideration during your travels. ​Most of all, HAVE FUN!